528.01 Winning the All-Ireland Céilí Band 15-18 Competition 2017 for the 3rd year in a row, Crossfields Céilí Band from CCÉ, Craobh Chronáin, Co. Cork, play a selection of Reels - “Mulhaire’s” and “The hunter’s house” (Ed. Reavy}. The band is coached by Alan Finn, leader of the Shandrum Céilí Band who also won their 3rd title in a row (Senior) in 2017. 528.02 Sinéad McKenna from CCÉ, Clogher Valley, Co. Tyrone, plays a Jig in 15-18 Fiddle competition at Fleadh Cheoil na hÉireann 2017 in Ennis, Co. Clare. 528.03 Taking 1st place in Senior Céilí Bands competition at Fleadh Cheoil na hÉireann 2017 in Ennis, Co. Clare, for the 3rd year in a row, Shandrum Céilí Band from CCÉ, Cr. Chrónáin, Co. Cork, play a Hornpipe - “The flowing tide”. Members of the Band are Mikie O’ Gorman, Mairéad Fitzgibbon and Eddie Kiely on fiddles; Timmy Collins and Brian O’ Loughlin on flutes; Alan Finn on accordion; Tadgh O’ Sullivan on concertina; Keith O’ Loughlin on banjo; Aileen O’ Callaghan on piano and Ger Naughton on drums. 528.04 From CCÉ, Birr, Co. Offaly, Séamus Kinsella plays a Jig in 15-18 Fiddle competition at Fleadh Cheoil na hÉireann 2017 in Ennis, Co. Clare. 528.05 Performing in the Scoil Éigse Tutors’ Concert at Fleadh Cheoil na hÉireann 2017 in Ennis, Co. Clare, - L/R - Jimmy Noonan and Erin Loughran ( both from USA), Caitlín Ní Gabhann and Gráinne Hambly. They play a selection of Jigs ending with “Come along with me”. 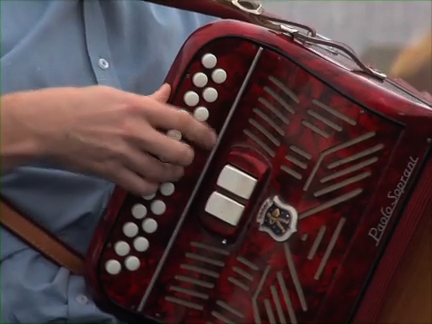 528.06 In Senior Button Accordion competition at Fleadh Cheoil na hÉireann 2017 in Ennis, Co. Clare, Philip Shine, CCÉ, Rockchapel, Co. Cork, plays a Hornpipe - “Fly by night”. 528.07 Taking 3rd place in Senior Fiddle competition at Fleadh Cheoil na hÉireann 2017 in Ennis, Co. Clare, Jake James from CCÉ, Mulligan- Quinn, USA, plays a Reel - “Splendid isolation” (B. McGlinchey). Incidentally, Jake took 1st place in Slow Airs competition. 528.08 Taking 2nd place in 15-18 Fiddle competition at Fleadh Cheoil na hÉireann 2017 in Ennis, Co. Clare, Caoimhe Ní Fhlannabhra, CCÉ, Teampall an Ghleanntáin, Co. Limerick, plays a Jig - “Paddy in London”. 528.09 Fergus Bogue from CCÉ, Ballinagh, Co. Cavan, plays a Reel when taking 2nd place in Senior Button Accordion competition at Fleadh Cheoil na hÉireann 2017 in Ennis, Co. Clare. 528.10 Taking 3rd place in 12-15 Trios at Fleadh Cheoil na hÉireann 2017 in Ennis, Co. Clare, Méibh Ní Dhubhlaoich, Gráinne Ní Mhuinneogh and Naoise Ní Dhubhlaoich from CCÉ, Baile Buí, Co. Offaly, play a Reel - “Sgt. Early’s dream”. 528.11 Winning the Senior Fiddle competition at Fleadh Cheoil na hÉireann 2017 in Ennis, Co. Clare, Roisín Ann Hughes from Irish Minstrels CCÉ, Glasgow, Scotland, plays a Reel - “Jenny’s welcome to Charlie”. 528.12 At a session (with enthusiastic dancers ! ) in the Templegate Hotel after taking 3rd place in Senior Trios at Fleadh Cheoil na hÉireann 2017 in Ennis, Co. Clare, Fergal Breen, Sinéad Mulqueen and Jennifer Markham (all from Co. Clare), play a selection of Reels - “The coalminer’s”, “The rookery” and “The red-haired lass”. The many happy listeners include multi-instrumentalist Ademar O’ Connor from CCÉ, Edenderry, Co. Offaly, who is being fitted with a special cap for his new hairstyle ! We’ll be featuring Ademar, who had several All-Ireland successes at the Fleadh, in the coming weeks. 528.13 Tieing for 2nd place in Senior Céilí Bands competition at Fleadh Cheoil na hÉireann 2017 in Ennis, Co. Clare, the Blackwater Céilí Band from CCÉ, Clogher Valley, Co. Tyrone, play a selection of Jigs - “The frost is all over” and “Donnybrook fair”. Band members are - Rosie Ferguson, Ursula McAdam, Eugene McKenna and Lydia Warnock on fiddles; James McCaffrey and Michael Coney (flutes), Ryan Hackett (piano accordion); Michael Curran (button accordion); Rachael Masterson (piano) and George McAdam on drums. 528.14 Taking 1st place in 12-15 Trios competition at Fleadh Cheoil na hÉireann 2017 in Ennis, Co. Clare, Oisín Francis, Sebastian Knoop and Thomas Brogan from CCÉ, Lackagh, Co. Galway, play a Reel - “The cup of tea”. 528.15 In Senior Fiddle competition at Fleadh Cheoil na hÉireann 2017 in her native Ennis, Co. Clare, Eimear Arkins, CCÉ, St. Louis Irish Arts, St. Louis, MO, USA, plays a hornpipe.